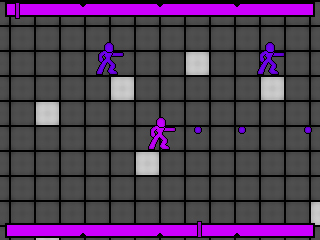 Here is a GP2X remake of my PS3 homebrew game titled Cascade Beneath. Its a simple fall down clone. 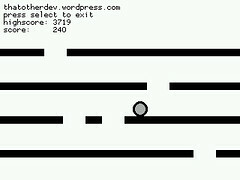 You just move from side to side and try not to let the platforms push you off the top of the screen as they slide up. Like with Dont Get Crushed the game increases in speed as you play it. One random nice little feature is that it automatically saves what you have the volume set at. So if you want to mute it completely, turn it up blaring loud or set it somewhere between you wont need to do it again the next time you start up the game. Unlike with the high score though (which saves as soon as you get a new one) the volume setting is only saved when you exit the game (by hitting select) so it wont save if you quite by turning off the power. The background music is Zombie Fighting Unicorn by Primaerfunktion. I’ve already released it for Wii, PC, PS3 and DS. So now here it is remade yet again. This time its for GP2X. 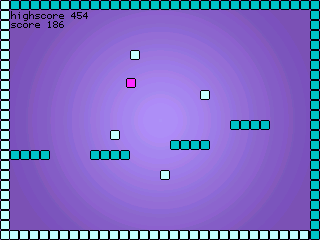 Dont Get Crushed is a simple game in which you must move left and right to avoid being crushed by balls that bounce across the screen. The longer you survive the faster the game moves and the higher your score will be. 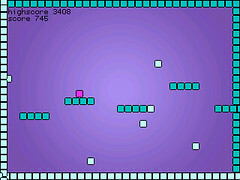 Its a clone of the iPhone game Falling Balls which I’ve admittedly never actually played. I don’t know why it took me so long to realize it. But a few days ago it occurred to me that I actually was the only one working on original PS3 homebrew at the time when I began my current PS3 hiatus and nobody had taken my place since then. There was laterally nobody releasing original PS3 homebrew. Its not that there was just a disappointing number of devs or that they where working slowly. Its that there really where none. Just nobody at all. There had been a few homebrew games put out by other people. Lachrymose released a Pong and shortly later a Breakout clone pretty early on. Apanloco released another Pong clone called Spin Pong. Finally Darkhacker released a game called Bomberman (which bares no relation to the bomberman franchise). But even the most recent of them came out four months ago and those few simple games aren’t much for a system that’s been cracked open now for half a year. The devs that made those games also don’t appear to be actively working on any new PS3 brew. Well it would be understandable that things may take time to start there is no evidence to suggest that it will get better. If anything the PS3 scene shows signs of slowing. Its effectively already a dead scene. Homebrew is by comparison thriving on my other two primary platforms of choice. But the Wii community seems to be slowing as well. The Wii Homebrew Browser is no longer updated weekly and more importantly the total number of things added or updated each month seems to be shrinking. There is just less content available to add then there once was. Similarly I remember a time when the release dates of the latest files posted on the openhandhelds GP2X file archive weren’t so far apart. Still. there is news that Team XeLove has proclaimed there intentions to port some of their 360 brew along with some unspecified new stuff to PS3. They don’t appear to have ever done any original games of their own which makes me wonder what to expect from their new project(s). But regardless of that I’ll admit that I’m excited by the prospect of OpenJazz, Super Mario War and/or an N64 emulator (though their N64 emulator does seem to run unplayably slow on 360…) showing up on PS3. Drunken Coders is having a competition this month for GBA, DS, GC and Wii. Nintendomax‘s annual Wii dev competition has also begun again and will be running until May 31. Both of them should incite some devs to work on things they might otherwise not bother making. Speaking personally I’ve already secretly begun working on something specifically for the Nintendomax competition and I’m hoping to be able to throw something together in the next few days for the Drunken Coders competition. The GP2X community is still alive and kicking also. It may have slowed slightly but for a five year old and slightly obscure system there is still a reasonable amount of stuff that’s been put out for it in the past few months. Even just in the last day there was a new EinStein würfelt nicht game posted. Here is a small update to something random and old. I’ve added sound controls to Super Pixel Jumper for GP2X (tested with an F100). 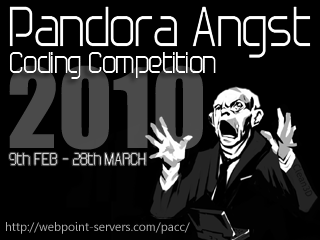 I just realized that the results for the 2010 Pandora Angst Coding Competition are apparently in. 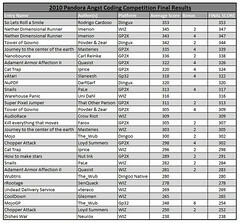 Super Pixel Jumper got an average score of 311 (plus 2 bonus points) which put it in 13th place out of 30 (with second and third place apparently both being the same game?)! 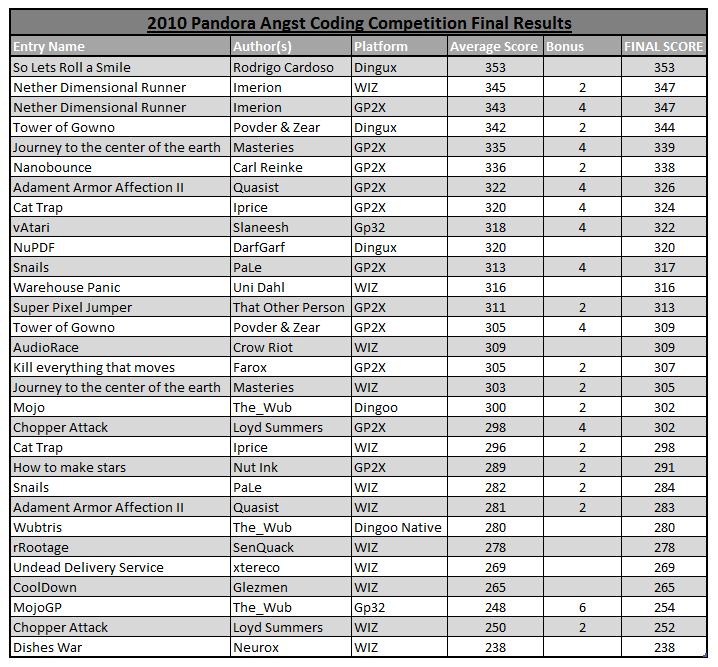 It was perceived as being somewhat sorta slightly a little maybe better then the other submissions on average! Nowhere even remotely close to wining but I’m still freaken happy about how that turned out.